A farewell oration or speech; especially, one that is made at a graduation ceremony. 1. A prolonged bitter feud or quarrel: Despite living in the same house, Jake's parents maintained a vendetta with their closest neighbor with whom they had not spoken to directly for over five years. 2. A blood feud between families started by the killing of a member of one family that is then avenged by the killing of a member of the other family: The vendetta between two branches of the family had lasted so many years that no one actually remembered how it started or what it was all about. 3. 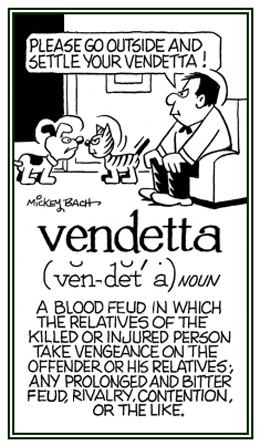 Etymology: from Italian vendetta, "a feud, a blood feud"; from Latin vindicta, "revenge"; "vindictive"; from vim dicare, "to show authority"; from vim, accusative of vis, "force" + root of dicere, "to say". 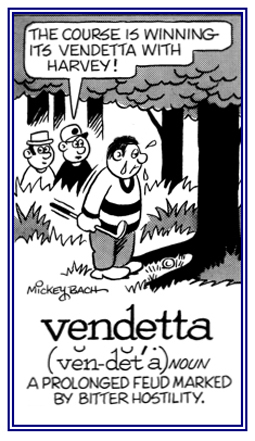 English speakers borrowed vendetta from Italian, from which it ultimately traces to the Latin verb vindicare, "to lay claim to" or "to avenge". 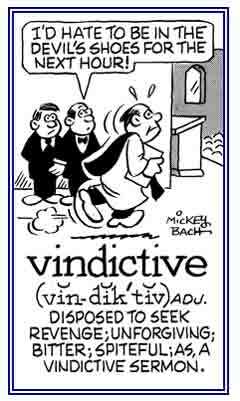 That Latin word is also in the family tree of many other English terms related to "getting even"; including avenge, revenge, vengeance, vindicate, and vindictive. © ALL rights are reserved. 1. Infliction of punishment in return for a wrong committed; retribution: Angry protestors in the country want to inflict vengeance on the president for sending snipers to shoot and to kill so many rebels who were demonstrating against the government. Henry attacked his sister's husband to get vengeance for her murder. 2. With great force or effort: The winter storm struck with a vengeance, destroying many trees and homes. Sharon set to work with a vengeance and finished her assignment in three hours instead of the usual eight hours. 3. 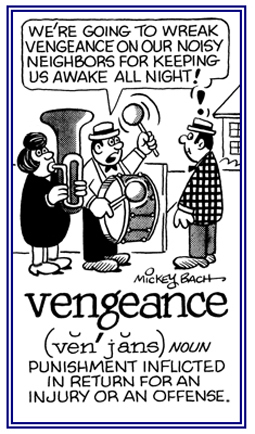 Etymology: from Anglo-French vengeaunce, Old French vengeance, "revenge"; from vengier, "to take revenge"; from Latin vindicare, "to set free, to claim, to avenge". © ALL rights are reserved. 1. Referring to someone who expresses a strong desire to harm others in return for perceived injuries: The ex-criminal was committing vengeful acts against the community where he was convicted by robbing their banks. 2. 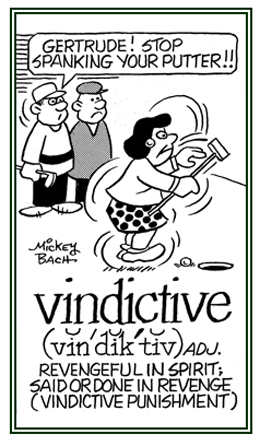 Etymology: formed on the analogy or similarity of revengeful from the out-dated verb venge; from Old French venger; from Latin vindicare, "to punish, to inflict pain or evil on a wrongdoer". Descriptive of feeling, showing, or having a desire to hurt someone or others: Manfred's brother vengefully shot his partner when she threatened to leave him during a severe argument. 1. The decision of a jury in a civil or criminal case about an issue which has been submitted to their judgement: The members of the jury debated the evidence for several hours before finally reaching a verdict. 2. A decision or opinion pronounced or expressed about some matter or subject; a finding, a conclusion, or a judgement: The academic committee at the university reached a unanimous verdict about the admission of the new candidate for the doctoral program. 3. Etymology: from verdit,, the Anglo-Norman variant of Old French veirdit., "true statement, sworn testimony" which evolved from verdit, the Anglo-Norman variant of Old French veirdit., " a true saying" or "report". This was a compound formed from veir "true" (a descendant of Latin verum, related to English very) and dit, "a saying, a speech"; which came from Latin dictionem, "a saying, an expression, a word". 1. A reference to telling the truth or being honest: The witness gave veridical testimony as to what really happened the night the teenager was shot on the street. 2. Characterized by something that corresponds with facts or to reality, and therefore is genuine or real: Jimmy had a veridical hallucination that his parents were injured in an auto accident which turned out to be true. 3. Etymology: from Latin veridicus; from verus, "true" + dicere, "to say". 1. 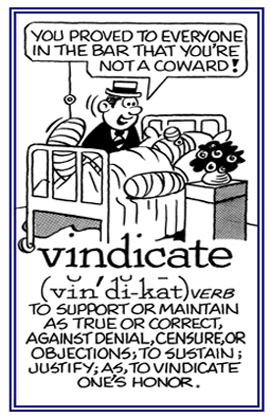 The act of defending against being blamed for or suspicion of doing something wrong: The vindication of the doctor for his unusual medical treatment was supported by the patient's miraculous recovery. 2. An action or circumstance which is proven to be reasonable or justified: Karl's decision to complete his computer programming at the university was a vindication that prepared him for his successful technical career. 1. Someone who argues to defend or to justify some policy or institution: Henry was a vindicator for telling the truth and being an honest politician. 2. Those who proclaim justification for certain actions or policies: The vindicators maintained that the violent back ground of the suspect justified the use of force by the police. Relating to something; such as, facts or an argument that justifies a belief, a conclusion, or an action: Mike's vindicatory decision to continue with his project was well received by his superiors at the automobile company. 1. A reference to doing something with a desire for vengeance: Driving his car over the newly planted garden next door was really the most vindictive thing Sam could do in response to his neighbor's criticism about making so much noise last night. 2. Relating to showing or doing something with a desire to hurt another person: The more angry Rose became, the more vindictive she was in terms of planning her revenge for the insults that her co-worker made about her incompetence. 3. In law, used to describe damages awarded by a court that are set higher than the amount necessary to compensate the victim, in order to punish the defendant: The judge exercised a vindictive judgment in ordering the accused to pay the court costs of the trial as a lesson not to attempt to exploit the legal system again. 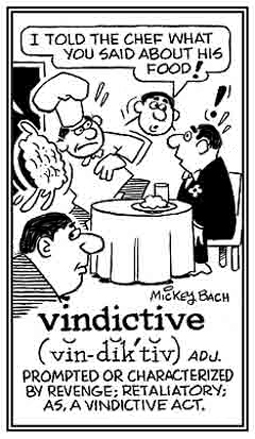 In a revengeful manner: Patricia plotted vindictively against her former employer because she was convinced that he was not justified in reducing her pension. A spiteful situation that is marked by or which results from a desire to hurt another person or other individuals: Karen's husband showed a vindictiveness towards her during the divorce proceedings because of her accusations that he was unfaithful, which he strongly denied. 1. A reprisal or retaliation against someone who is considered to have done a harmful thing to another person: Maxine was considering a vindictivolence, or repayment, for a neighbor who threw rocks onto her lawn; however, her religious beliefs made her reconsider any such action and so she gathered the stones and put them in a corner of her backyard. 2. 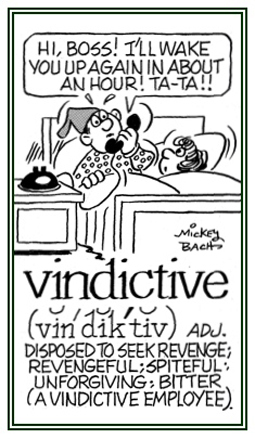 Etymology: from Latin vindicta, "avenge, vengeance (punishment inflicted)" + volent, "wishing". 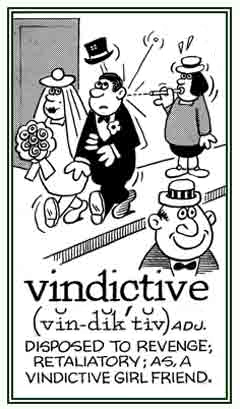 Although the following cartoon is about an adjective vindictive, it also illustrates the meaning of the noun vindictivolence! Showing page 10 out of 10 pages of 150 main-word entries or main-word-entry groups.